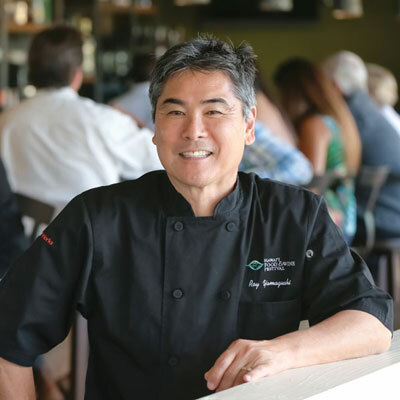 Culinary pioneer Roy Yamaguchi is regarded as an international culinary visionary and the creator of Hawaiian fusion cuisine. The founder and owner of Roy’s restaurants will be Saint Martin’s University on Nov. 3 to host Saint Martin’s Gala 2018: Hawaii and Pacific Islands. Born in Tokyo, Yamaguchi had his first taste of seafood bought fresh at seaside piers on Maui, while visiting his grandparents. It is these fond memories that would shape his future career. At 19, he graduated from the Culinary Institute of America in New York as a master chef. After moving to Los Angeles, he served as executive chef at La Serene. Yamaguchi then decided to head closer to his roots. He moved to Hawaii and opened the first Roy’s in 1988. Yamaguchi’s numerous accolades include the prestigious James Beard Award. He hosted six seasons of the television show Hawaii Cooks with Roy Yamaguchi. He is also the author of three cookbooks. The following are excerpts from our interview with the renowned chef. What is your best-kept cooking secret? A lot of hard work at the end of the day. I love what I do. We make sure that people come first. Our people and the people who come through the doors are always the priority. Why is good food important to the next generation? Cooking with your kids is important because then they get used to having good food. I recommend bringing kids to the restaurant early so they learn to talk with the server—and also learn about manners and nutrition. Food is an international language, it’s a tool to connect all of us. Why is the presentation of your dish so important? People eat with their eyes. We like [the dishes] to look picturesque so our guests savor every bite. Why are you excited to be cooking at the Saint Martin’s Gala? I’m excited to be a part of the educational environment. At Saint Martin’s we will be able to have fun and do some inspirational cooking. I love music and I’m a drummer. Playing the drums is like working in a kitchen. Everyone plays a part in the production of food in the kitchen, and in a band everyone plays a part in the harmony of the band.